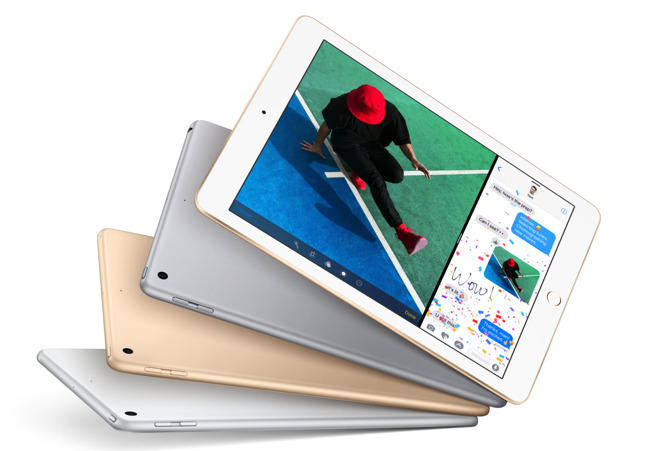 The new 9.7-inch A9-powered iPad, released on Tuesday, has an A9 processor, base 32GB of device storage, and is 240mm tall, 169.5mm wide, has a thickness of 7.5mm, and weighs 469 grams with wi-fi and 478 grams with LTE. The original iPad Air with A7 processor from October 2013 is dimensionally identical to the new iPad, including weight. The iPad Air 2 with A8X processor was originally released in October 2014 and is also 240 mm tall, and 169.5mm wide —but is 6.1mm thick. The iPad Air 2 weighs 437 grams with wi-fi and 444 grams with LTE. The 9.7-inch A9X iPad Pro has the same external dimensions as the iPad Air 2. At this time, it is not yet clear why Apple returned to the slightly thicker size for the new iPad. For comparison, the original iPad is 242.8mm tall, 189.7mm wide, 13.4mm thick, and weighs 680 grams. The return to the iPad Air sizing has implications for accessory makers. The slightly thicker iPad Air may create a renaissance for tight-fit cases and other size-dependent peripherals, the same as the iPhone SE did when it resurrected the iPhone 5 form factor in 2016. On Tuesday, Apple revealed a special edition (Product)Red iPhone 7, the doubling of storage on the iPhone SE without changing the price of the device, and a new Clips app for social media video generation.